If you have visited any of our Bazaar del Mundo Restaurants, you know we love lively mariachi music, a style rich in Mexican history and culture! First appearing in the nineteenth century in the Mexican state of Jalisco, mariachi groups are known for performing at religious celebrations, plazas, big family events and restaurants – but their appearance has changed over the years. Early mariachi groups consisted only of string instruments, including guitars and harps, but as jazz music became more popular, the trumpet was introduced – now a beloved staple of the band. Spreading their culture to the U.S., the first appearance of mariachi groups flourished in California. Now the groups are known all over for spicing up celebrations! 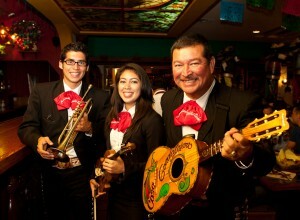 Guests love mariachis’ traditional clothing. Commonly called a charro suit, this outfit usually includes waste-length jackets, pants or skirts, and embroidery with leather designs or silver buttons. If you haven’t had a chance to experience mariachi music, it’s time you visited one of our restaurants for an unforgettable fiesta! We invite you to celebrate your special occasion with us or join us for dinner and drinks, where you’ll be transported south of the border by our strolling mariachis. 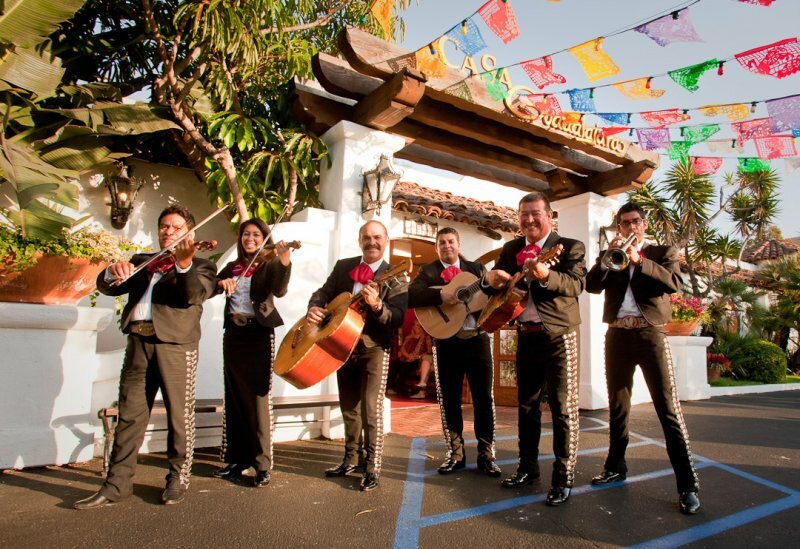 Thursday-Sunday: mariachi band 5:30-9:30 p.m.
Thursday-Sunday: mariachi band 6-9 p.m.
Thursday-Sunday: mariachi band 5-9 p.m.
Wednesday-Thursday & Sunday: mariachi band 6-9 p.m.
*For more information about mariachi music, click here. Imagine it’s 1920. You live in abject poverty, and the Great Depression just north of the border of your home in Mexico is looming. Your father suddenly passes away, and now it’s just you and your brother. And you are 12 years old. A sad story, isn’t it? Not for Filemon Rodriguez. He and his brother used what resource they had, a harp in their living room, and taught themselves how to play music by ear. No lessons, just learning by playing the same songs over and over. The boys scratched out a living by playing music in the streets. Not only did they scratch out a living, but a family profession that is now in it’s third generation was born. Filemon went on to have a family of his own: 4 boys and 3 girls. One of his sons, Luciano Rodriguez, became a professional musician. His band, Cielito Lindo, has been playing at Casa Guadalajara since 1996. Their repertoire includes over 2000 songs. And it all started with his father learning to play on a harp to feed his family. Casa Guadalajara is known as one of the finest San Diego Mexican Restaurants. Our food and our margaritas are legendary. We consider Cielito Lindo to be just as important an ingredient of our success. Visit our website at http://www.casaguadalajara.com and click on “Entertainment” at the top of the page. You’ll be taken to the schedule of Cielito Lindo. Make it a date to come, have dinner and hear this amazing group of talented musicians with such a rich heritage of playing their music with passion. It’s part of what makes Casa Guadalajara the most unique mexican restaurant in San Diego.